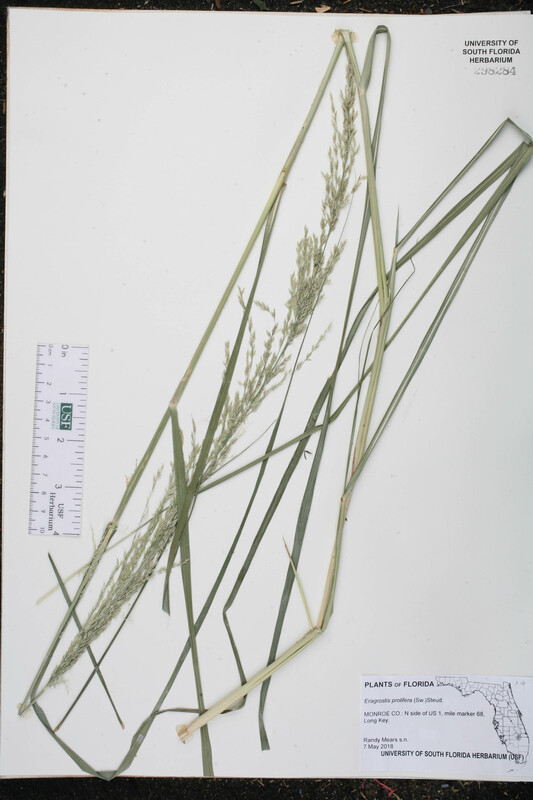 Citation ERAGROSTIS PROLIFERA (Swartz) Steudel, Syn. Pl. Glumac. 1: 278. 1854. Basionym: Poa prolifera Swartz 1788. Type: GUADALOUPE: Without data, Swartz s.n. 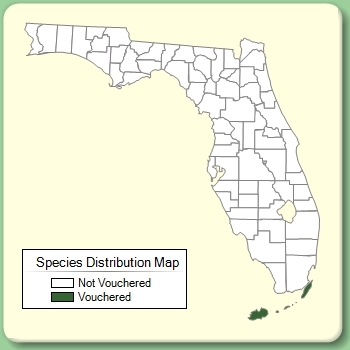 (holotype: S; isotype: K). Eragrostis domingensis Eragrostis domingensis (Persoon) Steudel, Syn. Pl. Glumac. 1: 278. 1854. BASIONYM: Poa domingensis Persoon 1805. Poa domingensis Poa domingensis Persoon, Syn. Pl. 1: 88. 1805. Poa prolifera Poa prolifera Swartz, Prodr. 27. 1788. TYPE: GUADALOUPE: Without data, Swartz s.n. (holotype: S; isotype: K). Eragrostis albescens Eragrostis albescens Steudel, Syn. Pl. Glumac. 1: 269. 1854. Eragrostis diversiflora Eragrostis diversiflora Vasey, Contr. U.S. Natl. Herb. 1: 285. 1893. TYPE: MEXICO: Colima: Manzanillo, 1891, Palmer 1335 (holotype: US). 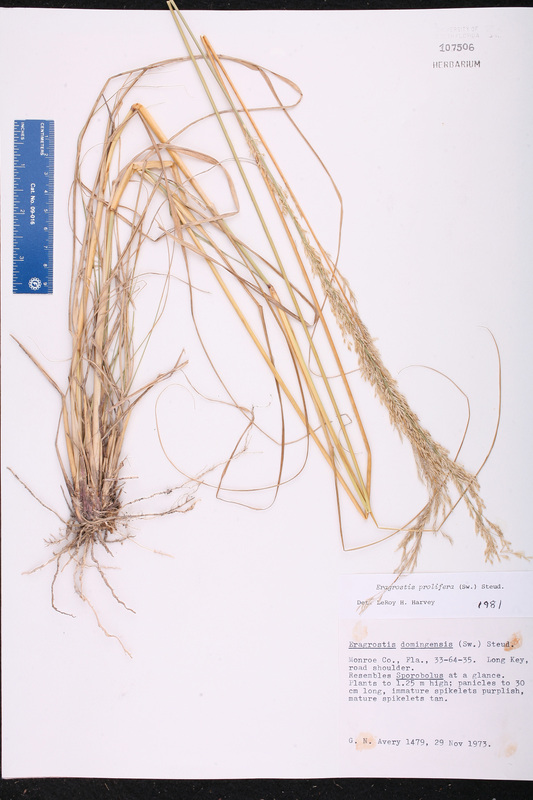 Eragrostis fascicularis Eragrostis fascicularis Trinius, Mém. Acad. Imp. Sci. St.-Petersbourg, Ser. 6, Sci. Math. 1: 403. 1830. 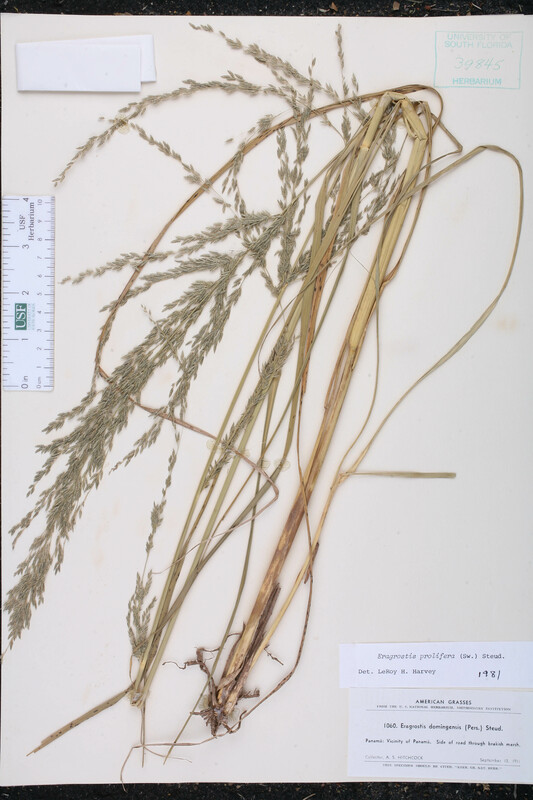 Eragrostis guineensis Eragrostis guineensis Trinius, Mém. Acad. Imp. Sci. St.-Petersbourg, Ser. 6, Sci. Math. 1: 414. 1830. Eragrostis haenkei Eragrostis haenkei J. Presl, in C. Presl, Reliq. Haenk. 1: 279. 1832. TYPE: MEXICO: Without data, Haenke s.n. (holotype: PR; isotype: US(fragm)). Eragrostis hagerupii Eragrostis hagerupii Hitchcock, Proc. Biol. Soc. Wash. 43: 92. 1930. Eragrostis linearis Eragrostis linearis (Schumacher) Bentham, Fl. Nigrit. 467. 1849. BASIONYM: Poa linearis Schumacher 1827. 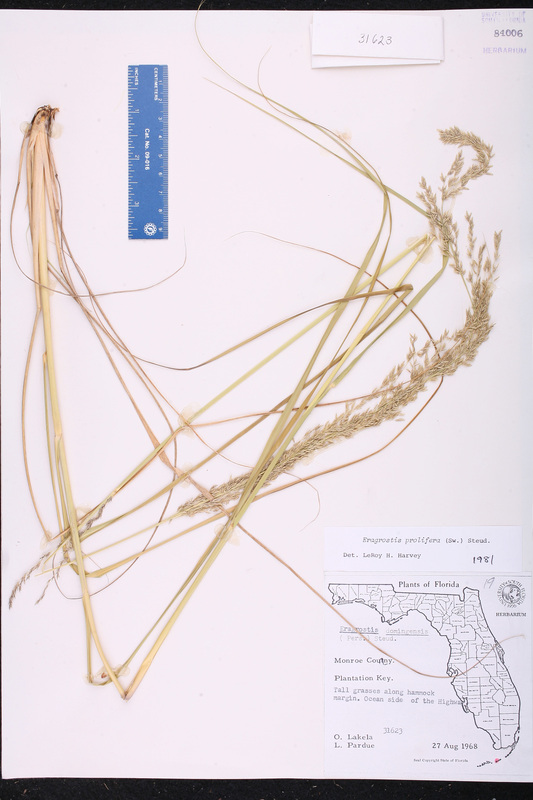 Eragrostis pallescens Eragrostis pallescens Hitchcock, J. Wash. Acad. Sci. 19: 303. 1929. 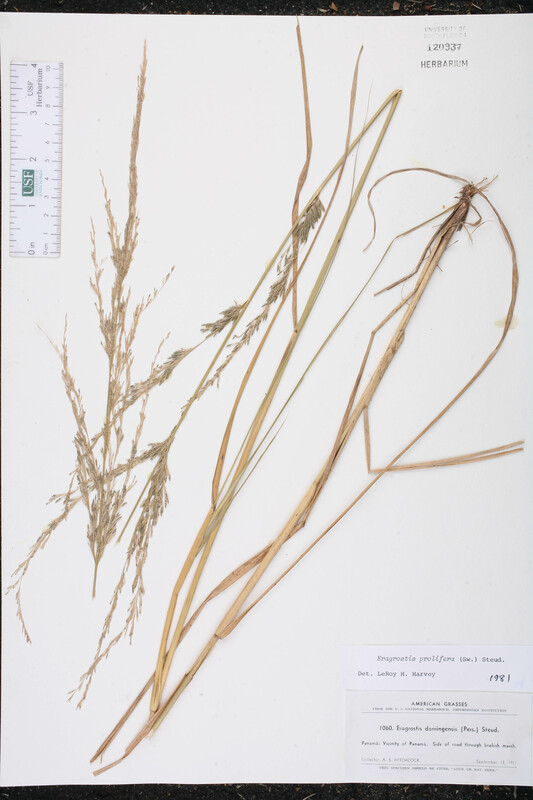 Eragrostis salzmannii Eragrostis salzmannii Steudel, Syn. Pl. Glumac. 1: 277. 1854. TYPE: BRAZIL: Bahia: Without data, Salzmann s.n. (holotype: P; isotypes: K, US). Poa linearis Poa linearis Schumacher, Beskr. Guin. Pl. 67. 1827. Poa subulata Poa subulata Desvaux, Opusc. Sci. Phys. Nat. 102. 1830. USA Florida Monroe Co. 07 May 2018 R. Mears s.n.